Some girls shop online for cute clothes and shoes, I shop for my next race. Call me crazy but I am constantly on runningintheusa.com perusing my possibilities to explore a new trail or road. I found Sasquatch Racing through Instagram to my surprise and was even more pleased when I received a free entry into their Krampus 10k event. An early start prompted a thirty minute drive up the peninsula, to the Marina district of San Francisco. The sun had cast off it’s pajamas, had his coffee and was in full force of making the day a clear and beautiful one. Work kept me from an early bib pickup and beer sampling at A Runner’s Mind in SF the Friday before Sunday’s event, but Sasquatch made race morning a breeze! Ample parking was found just a short walk from the start. A few stairs took me away from my car and towards a road leading to a grass field that would host the start and post-race festivities. A small table stood on one side of the field where two volunteers were checking off names in exchange for bibs. I easily collected mine, as well as a black tech shirt, exhibiting the Krampus event logo. With a few minutes until the start, I decided to ditch my jacket and a nice volunteer offered her surveillance as I ran. As I did not want to throw my jacket into a pile of bags others had left, I graciously accepted her offer. Immediate elevation gain stung my lungs and I was taken off guard. Have I not been training long distance since July? Oh boy! It was fine once I got my pace after the first mile. Surrounded by giant redwood trees and bay air replenishing my lungs, I was taking in the beautiful views of San Francisco’s Presidio and even catching glimpses of the water. Sasquatch Racing had advertised small silver medallions placed along the trail that would serve as tokens to collect prizes at the end of the race. I am not sure if it was my more modest pace or the scenery stealing my gaze, but I never happened upon any prize winning medallions. From packed trails, to roads and wood walkways, this course offered a nice variety of terrain over the span of six miles. A number of volunteers helped to direct our pack and safely maneuver traffic. I headed down a road to be greeting by the distance frontrunners, 3 males, one of them donning the bib number, 666. I made my way along some more wood walkways with deep gradual steps. A set of stairs stood between a short cul-de sac turn towards the finish. I grabbed some Gubrew, thanked the volunteers and made my back over the befriended ground. I was able to cheer those along that were still heading out as I ran back. Over the wood turning to asphalt, and dirt, I felt stronger heading home. The trail felt more alive with different forms of energy coming from nearby walkers, trail yogi’s and other race goers. I was able to pass a few people and was happy to come up upon the former ascent, descending toward’s the finish and Krampus. After crossing the tape, I was greeted by strands of flowers, and volunteers waiting to place the woodallions around finisher’s necks. I grabbed a quick photo with Krampus himself and caught a glimpse of the winner, Bib 666. I headed towards a small lineup of tables, where volunteers had made little goodie bags containing Beanitos chips, Bare baked apple pieces, Kettle chips, and pieces of candy such as Twizzlers and Nerds. Reps from Noosa yogurt were handing out samples of their rich and delicious pumpkin variety, as well as Bark Thins giving out small bags of their snacking chocolate. Hint water handed out bottles of their refreshing fruit water. I want to give a huge shoutout to Sasquatch Racing for putting on a fabulous event. It felt like one big family, between the Sasquatch crew, volunteers and the race goers helping put out a fun and safe atmosphere throughout the course. Registration and parking was easy as can be, and the course was beautiful. With multiple races throughout the year, I look forward to checking out more of their events in 2018! Most family and friends tend to look at eye color and facial structure to understand whether a baby gets a certain feature from each parent, my family measures adoration for chocolate in likeness to my grandmother’s side of the family. No one can compete with her love of double chocolate (don’t forget the chocolate syrup!) milkshakes and twelve king size bars she acquires each Christmas. While my grandmother is the Queen of all things chocolate I am a Princess. My sweet tooth however, still led me to the Hot Chocolate series and after not receiving my fill of chocolate in 2016, I decided to return for more in 2017! Hot Chocolate sets up camp at the Salt River Fields at Talking Stick. This is a giant baseball stadium which hosts baseball teams such as the Arizona Diamondbacks and Colorado Rockies for spring training sessions. The covered promenade section was converted from pretzel and hot dog sellers, to all things chocolate for the weekend’s festivities. Upon entering, bib pickup was located to the left. With a simple scan of one’s mobile ticket or a gander of an I.D. the runner was given their bib and sent to pickup the Hot Chocolate logo’d 1/4 zip included with registration. This year’s option was purple for female runners and blue for the men. This is a nice change from a typical race t-shirt. There were chiropractors doing massages, as well as vendors selling socks, shirts, nutrition. Sole Sports Running Zone had a nice setup with a miscellany of discounted shoes. Hot Chocolate even had their own little section of branded shirts and jackets. Having been to quite a few expos throughout my running career thus far, I now make a point of getting in and out. That being said, I may have stopped by the Hot Chocolate booth handing out samples of cocoa and fondue, however. Many of the Scottsdale hotels will offer shuttles within a certain mile radius which is a nice bonus to look out for! I grabbed an Uber, as my hotel only had shuttles that ran during the week and set out to explore the town for the remainder of the afternoon. A chocolate bar big enough for my grandmother! The race starts on one of the roads within the Salt River Field facility. With 2 distances and many corrals, event staff slated the 5k for a 7:30 start and the 15k close behind at 8:15. With about 40 Port o’ Johns there were still huge lines. I arrived at the start with about 30 minutes and spent all of that time waiting for my turn. Luckily the start was stalled a few minutes and before I knew it, I was off and running. This course is nice and flat, allowing views of the McDowell and Phoenix Mountains. By the first mile, volunteers were handing out marshmallows. These were not average mallows however, but displayed a golden hue and tasted similar to caramel! This station was followed by Nuun, an electrolyte beverage, and water cups. After another mile or two, I came across another station handing out chocolate chips. These semi-sweet chocolate pieces proved to be a nice stimulant. With more hydration to follow, I ran onward, my gait feeling slightly clunky. As I weaved my way through this small section of Scottsdale, the streets are lined with small businesses and offices and of course, enthusiastic volunteers. I came upon another sweet station of Christmas colored candy corn but opted out of this sampling. With a few turns, I was running towards the aquarium. I had hit the 10k mark in 58 minutes, my first time receiving a sub hour time. With only three more miles to go, I focused on keeping my stride the same. I turned up a slight incline, about a mile of road before I would U-Turn and make my way back to the baseball fields. The final sweet station was located at mile 8, passing out candy canes with Nuun and water following just behind. Once again, I opted out of this one, being so close to the finish line. As I entered back onto another road leading into the Salt River Fields facility, families were stationed holding signs and cheering. Even runners who had already finished were urging runners on, calculating how many more seconds of running we would have to endure. I crossed the finish line with an 8 minute P.R. from last year’s race. A volunteer placed a chocolate bar medal around my neck and I was off to the finish line area, ready to receive my chocolate finisher’s mug. This giant plastic wonder is divided into sections. The middle holds a steaming cup of delicious hot chocolate. Perfectly rich without being too sugary. Next is a section of hot, chocolate fondue, perfect for dipping all of your goodies in. A mini krispy treat, pretzels, banana, cookies, marshmallow and mint are the perfect accompaniment. Definitely worth a 9 mile run! This area is perfect to celebrate post-run victories. With plenty of room to sit and enjoy the finisher mug, there are also games for the kids and young at heart. A DJ was playing music to keep the party alive. If you enjoy chocolate this is the race for you! The expo is easy and fun while the race offers plentiful support. I hope to see you, chocolate covered fingers and all, in 2018! While I am not a fan of Las Vegas during the day, when the sun sets, the strip becomes a completely different place. I walked across the bridge connecting the MGM Grand to the New York hotel. My eyes were focused on the marathon corrals in place, ready to run. Soon, I joined them, focusing on the DJ and the helicopters overhead, a reminder of October’s tragic event. As a new corral was released, I slowly inched forward towards the start line. As I was about to start, the leaders appeared on the other side of Las Vegas Boulevard, a steady battle to see who could maintain power, strength, eventually being the victor to break the tape. The course led me towards Mandalay Bay. For the first couple of miles, the road was rough and dark, with just enough light to illuminate the potholes. I came up on the infamous Las Vegas sign, deciding not to stop for a picture but a blurry, mid-run capture would have to do! I loved the turn around at the 2 mile mark. As the sky grew darker and inky, the Strip was irradiating radiant colors, coaxing the runners closer. As I passed the airport, my legs were carrying me further down the Strip. I came upon the start and corrals were still being released. The vibrance to my left and right and from what I could see ahead helped me to find a comfortable pace and stay on it. I was just reaching the stretch of live bands performing on course! This is what Rock n’ Roll is known for and it was fun to see musicians playing tribute to Kiss and covering songs both new and loved. As I was nearing the end of the Strip, the energy changed slightly. I had hit the end of hotels and casinos and found myself in a more dreary area that was home to some pawn shops. The course picked up again once I hit the section of wedding chapels! These are a kick! Fake flowers and huge animatronic Elvis’ dancing on signs really takes the mind off the distance. Rock n’ Roll even offers a run through wedding option, which many couples take advantage of each year! At mile 8, volunteers were handing out SIS gel. I’m not sure if it was because I was in the middle of the road and it was dark, but I totally missed seeing the volunteers handing out the gels until I had passed them. Nearing the north end of the Strip, I was flying towards the Downtown area and Arts district. Complete with neon signs and lots of color, I made a little loop onto Fremont St, enjoying the view before it was a straight shot to the finish. Whenever I am within a few miles of the finish, I always try to spy landmarks and configure my proximity. While there were mile markers on the course, they weren’t as prominant as they are in other races. I hit the Stratosphere and knew that the Mirage volcano was not too far behind. Once again, I felt the lights from the city illuminating the road and energy on course, as if each bulb had its own cowbell. A race announcer was floating above the finish, hoisted by a balloon as she cheered on the incoming runners. I crossed the finish a minute faster than my previous PR at Urban Cow in October. As good as I felt for the whole race, I was able to push hard and was hoping for more than a minute improvement. I collected my spinning die medal and picked up some water, pringles, Oatmega bar, chocolate milk and Pocky sticks . I took a minute to replenish my body with some protein and salt! I didn’t get my ID checked at the expo, so without a wristband, I was not able to get a beer at the finish. As I slowly made my way down the strip towards my hotel, I kept stopping at medical tents asking for a mylar blanket. Each one told me to keep going down until I finally hit the last one which did not possess any either. While the race was warmer than some years, this is still something I like to see at finish lines. When will I learn my lesson to pack a jacket in bag check? With the finish line location near the Bellagio, I had a little walk down the strip. The other side of the boulevard had not yet been opened to traffic so I was able to easily cross and make my way back towards the south end of the Strip. This race has been on my bucket list for a couple years now and let me tell you, it did not disappoint. With contagious energy, the run felt fun and effortless. I wish the beginning of the course was able to offer more lighting for runners and the tables of gel made more easily visible and accessible. Neither of these are deal breakers, just small things noticed. I had a blast catching up with old friends, eating delicious food and accumulating some miles. The Strip is definitely one of my favorite victory lap spots to date! I hope to visit again in 2018. I lead an active lifestyle. When I am not driving to the gym, I am heading to work, hitting the trails and I never seem to stop. While I am a fan of protein bars, so many of them contain chocolate, which on warmer days, starts to melt and can create a mess. I have compiled a list of my favorite car snacks that fair well in the warmest and coldest of conditions. I cannot get enough of these grass-fed beef sticks! I love the Original flavor but the Jalapeño puts some zest in my step! With only 100 calories and 9 grams of protein, these are the perfect snack to help muscles recover, while also filling a gap between meals! With a variety of flavors to choose from, these oatmeal and fruit packs are perfect for a quick breakfast or snack. These pouches contain a good source of fiber and Omega 3 (flax) that help keep my energy up throughout the day. Ranging from 90-110 calories, depending on the flavor, I love this marriage of fruit puree and oats! I love keeping a packet of these pitted olives in my car for a salty yet beneficial snack! Olives are full of vitamins, minerals as well as amino acids. These elements help to strengthen the immune system while natural fats and oils help to speed up recovery! With only 50 calories per pouch, Oloves provide a quick boost with minimal calories. This protein filled snack is the perfect accompaniment to any trail or post workout fuel! Made with real cheese and organic quinoa, these crunchy bites offer delicious flavor and 10 grams of protein in a one ounce serving! Whether I am on the trails or out running errands, Wild Zora gives my body the satisfaction it needs when I am on the go. A healthier and more tender alternative to jerky, Wild Zora creates delicious flavors packed with 7-9 grams of protein. Calories ranch from 100-130 per packet with a variety of meat to choose from such as beef, lamb, pork and turkey. I hope you find the perfect fuel to keep healthy and strong! After munching on the 10k the previous morning, I was ready to take on the main course of the Wine and Dine weekend. I put on a white shirt, tights and a bavarian hostess dirndl to complete the ensemble. While it is not an iconic Disney character, I dressed to support Epcot’s International Food and Wine Festival! I walked to the front of my hotel and once again found a bus waiting to take me to the Magic Kingdom parking lot! I managed to arrive even a couple minutes earlier than the morning before, giving myself plenty of time to listen to the DJ, gaze at the event stage before parking myself on the ground of my corral. There was talk of the previous morning’s lip-sync battle and I easily could have enjoyed a second round, but pretty soon it was time to start running. I was excited! It was a new day with a different course and my first stop would be Animal Kingdom, giving my eyes the opportunity to take in what they could of Pandora. 4 miles stood between the start line and entering into Animal Kingdom. These first few miles took participants along tree-lined back roads. While the sun had no quite woken up yet, I felt energized with grass and trees surrounding me, unlike the rubble and machinery that had lined the 10k course. Fairly early into the course came the first character stop, Fairies, from Peter Pan and Tinkerbell’s spinoff adventures. I carried on, running into Captain Jack Sparrow and Captain Barbossa before seeing King Louis and Rafiki. Can you tell I was nearing Animal Kingdom from the genre of character stops? I entered the park, running through Harambe Market, getting a quick taste of what is modeled after Africa’s informal sector. Themed markets lined our path and dancers from Festival of the Lion King greeted me with smiles and waving hands. I was so excited to run through Pandora and every detail exceeded my expectations. While I did not receive any Banshee assistance to the finish line, I carried on towards the Tree of Life, then into Dino territory. A quick exit into the parking lot, led runners to a couple of longer stretches along the highway. With the sun trying to peek through the fog, it was hot and I now had an explanation to why I could not find a drive. I stopped for a quick photo with the Country Bears and wish I had done the same for Mary Poppins’ Penguins. As we approached mile 9, we came onto a circular on ramp that would take us on an overpass towards Hollywood Studios. Just as the morning before, Oswald greeted runners as they entered the Studios behind Tower of Terror and onto the boulevards. Runners followed the same path towards Epcot, so I could find relief in the familiarity of the course. Instead of going straight into the theme park as we did the morning before, runners took to the water’s edge and followed the path along Disney resort hotels. Genie greeted runners by the Boardwalk and the course finally entered into Epcot. I was hoping for the shorter route by the U.K. and Canada to take us to the finish but realized we were running all the way around World Showcase. I had to walk a few steps, devastated by the realization of the lengthy world travels ahead. I kicked myself into gear with only a mile left, Dopey and Mushu cheered me along. I was relieved when I was practically under Spaceship Earth, a short sprint to the finish line. In a little over two hours, it was nowhere near my P.R. from the beginning of October but a few minutes faster than last year’s Wine and Dine. I can blame my head cold and the humidity but I am okay that this was not my race. All runners will have those days and this journey is about realizing the worst has not yet happened and the celebration of victories are just on recess. This course has been my favorite I have run at WDW thus far. While I am partial to Disneyland races as they supply more park miles within their courses, this race returned a similar vibe to those events hosted in California. I collected my half medal as well as my Two Course Challenge passport, commemorating nineteen race miles, and multiple countries visited. I replenished with water but left the contents of my snack box (Oreos, applesauce, tortilla chips, cheese, dried fruit) to be consumed at a later date, as I had scheduled a rendezvous with some sweet potato pancakes. What makes Wine and Dine race weekend extra magical, is the Post-Race Party which is held Sunday evening after the race. All half participants received a complimentary ticket and had the option to buy additional tickets for non-runner family members and friends. As this would be my only visit to a theme park for the Wine and Dine weekend, I was especially excited. While the party did not officially start until 10 to give the kiosks time to restock and employees to kick the non-runners out, early entry started at 8. I arrived a little before and was able to get into the park. As the park slowly started to clear out, I headed towards Norway to get in line for Frozen Ever After. I only had to wait about twenty minutes while the ride normally boasts an hour at the least. On my way to ride Test Track, a line was forming to take pictures with the Three Cabarellos. Between minimal wait times for rides, special character photo opportunities and a DJ to keep the evening fun and alive, the party proved to be a sweet, final course to a decadent weekend. The 10k was the perfect appetizer to the Wine and Dine Half-Marathon weekend. While the 5k was technically the first course, the earliest I could travel to the East Coast was Friday evening, leaving my running to commence Saturday! I arrived at the expo to pick up my bib on Friday afternoon and a lot had changed from previously attended race weekends. For this race, bib pickup was moved to the upper level of the HP Field House and the whole lower level was dedicated to substantial aisles and walls of weekend merchandise. Here, any runner could find pins to collect, shirts, jackets and numerous “I did it!” items to celebrate awaiting victories. After collecting my bib and doing a quick walk through, I walked to a neighboring building, the J Center, to collect my race shirts and browse the exhibitors. While the complex seemed busy, Disney’s decision in expo placement provided a stress-free flow. With an all yellow garb, red parasol in hand, this Dole Whip was ready to run! I stayed at All-Star Music and was pretty impressed to see a bus waiting to take me to the start! When I ran Princess earlier this year and Wine and Dine last year, I remember waiting in a line just watching buses pass because they were full. Lip syncing and dancing to the beat of the music was definitely a fun way to pass the time and get a gentle warm up in before crossing the start line! I was slightly apprehensive to write this review as so many people stating how much they loved this course, while I felt differently. I had run two other WDW 10k’s and the course was the same which went around Epcot and bordering hotels. Disney went overboard on the whole “going green” recycling act. While this year’s 10k race was a change of scenery, it worked it’s way from the MK parking lot through long stretches of construction. The first character stop were the Three LittlePigs, 2 miles into the course. Just before mile 4, runners entered Hollywood Studios park, just behind the infamous Tower of Terror. Oswald greeted runners as they pounded down Sunset Boulevard. The short stretch was adorned with eager holiday lights and I could swear I could hear Christmas carols leaking from the speakers. A left turn onto Hollywood Boulevard whisked runners out of the park and onto a narrow stretch leading to the Boardwalk resort. Runners soon hit the wood planks and were greeted by the benevolent Genie dressed in his vacation attire consisting of a Hawaiian shirt and Goofy hat! While he could not grant me any wishes, I pushed towards the back entrance of Epcot. Runners entered just behind the United Kingdom, with Kenai and Koda from Brother Bear to cheer runners on toward the approaching finish line. I ran past Canada and made a straight shot for Spaceship Earth. The tremendous sphere was still radiating hues of purple and orange before the sun would rob the icon of it’s light. Finally I was running into the parking lot and across the finish to accept my first medal of the weekend. After collecting my medal, I drank some water and accepted a snack box from a volunteer. The lack of character stops and course left me undernourished. Four in the course of just over six miles is not very impressive. I have raced Disney 5k’s with more stops! I had heard a lot of people praising this course but the long stretches which were littered with construction is not something I can rave about. The good news was that the 10k race left me enlivened for the half course the next morning, promising three parks and more entertainment. 27 minutes until the start! Cow bells are commonly seen at races, luring runners toward the finish. The cow bell is a symbol for greatness, as it is not seen on every animal in the herd, but it is reserved for the fastest and strongest animal who will lead the others. As the sound causes a desire to move ahead or run faster than the others, I always welcome the empowering jangle to move my feet just a pinch faster. I don’t run for bling and this is one of two lies I told myself when registering for the Urban Cow Half Marathon. I saw the blue cow bell medal featured on social media outlets along with a kooky slogan of, “A Race Like No Udder,” so I obviously had to register. How could I deny myself a medal that symbolizes so much? They also promised a flat and fast course so I told myself to just have fun and not push it, (Lie #2) as I had already ran and PR’ed 19.3 of the 22.4 miles I had run the weekend prior. Living about two hours south of Sacramento, I booked one night in a downtown hotel and spent Saturday afternoon exploring the city after picking up my bib. Fleet Feet Sports dedicated hours both Friday and Saturday to participants picking up bibs. Located on one end of a shop and restaurant filled street, I was happy to see ample parking along all sides of their block, as well as a few spots in a lot just steps from their back door. Pick up was a breeze as I collected my number, beer wristband and shirt. Urban Cow had a small merchandise area, teasing shirts, hats and even cow print compression socks. I also paid a quick trip inside because would I even be a runner if I didn’t gander? The store was offering some discounts for runners on specific brands such as New Balance, which was nice of them! I decided to Uber a few miles to the start the morning of the race. The race offered parking at a nearby college with a shuttle but since I did not know the area, I decided not to add any stress to the morning. Urban Cow had a nice setup in the William Land Regional Park. With vendor tents, a bag check and even bicycle parking for the eco-friendly commuters. Event staff even had rented a cow themed bounce house for the little ones! The race started promptly after an anthem with two waves releasing the half-marathon runners first, followed by the 5k. Shade from lofty trees provided some cooler temps for the first mile as we weaved through the park. I felt like Pac Man as I made my way through sinuous neighborhood streets. Local high school volunteers were out every couple miles with water, keeping us well hydrated. I finally came across the first of many bands on course which was a trio singing country. We made our way through an industrial district making our way towards Downtown Sacramento. Ukes of Earl were playing around the mile 4 mark, inviting a lovely taste of the tropics as runners went by. I kept checking in with my body and my watch, surprising myself with a comfortable yet decent pace. Grand arched signs in green and black with gold lettering dictated our nearing arrival in Old Sacramento. An underpass brought us to a street that resembled an old western town. A small collection of stores, saloons and museums present a facade from an older era. I caught a glimpse of the yellow Sacramento bridge and followed the bike path along the river towards the midway point. Urban Cow offers a two person relay, giving a pair of runners to split the distance of the half. This transition could have been a little better organized to avoid runners stopping right in front of those not participating in the relay exchange. Continuing another half mile on the path, we entered Miller Park where a couple more bands would grace our ear drums. At this point in the race, the tribute rock bands were much appreciated, giving runners an energizing tempo to match our running pace to. Miles 8-10 parallel the Sacramento River, presenting participants with scenery and a nice breeze. During this portion of the course, Urban Cow provided motivational signs expressing admiration of our feat thus far. Towards the end of this stretch, a Chinese drum band tapped runners in the direction of the finish. A sharp lefthand turn, takes runners from the bike path onto Riverside Blvd. I saw the tips of trees and knew the park was close, my legs trying to keep pace with my heart. Volunteers and spectators were complimenting my cow hat and encouraging me to hoof it the final two miles. Finally we turned into William Land Regional and runners just ahead ushered me back along what was the first mile of the course. Finally the finish line was in sight but the road curved into a giant U, still putting some distance between our current location and the tape. With the clock looming, my feet felt light and fast and before I knew it, my arms were up in the air and I was celebrating a five minute PR from the weekend before! I was one with the herd. While everyone around me was “bearing their bell,” I was too, in the sense, “to take the first place.” Of course I did not break the tape, but taking first place in my mind and heart with my shiny new PR! With my medal clanging, I continued down the finish chute towards water and food. Volunteers passed out mini Lara bars, Clover greek yogurt, chocolate milk, trays of strawberries, and glazed donut holes (I was ecstatic about this last provision). I headed to the beer garden to mingle and discover Lagunitas offering two varieties of brew. Volunteers even were filling paper food trays with salty Kettle Chips! This race thought of everything! While I know I’m supposed to replenish my muscles with protein, sometimes my soul is just too loud, so I indulge on carbs and fat. I traveled to this race thinking it would be a fun, local event. Urban Cow turned out to be one of my favorite events this year! The half was very well organized with quality shirts and medals, providing runners with about ten local bands on course! I HIGHLY recommend this event to anyone who finds themselves in the Sacramento area next fall! I hope to see you out moo’ving on the roads and trails! The weather in Anaheim for race weekend made Hades and the Underworld seem a bit chilly. After a fun course, running primarily through both Disneyland as well as California Adventure on Saturday, I was ready to tackle thirteen miles the following morning adorned with a red cowgirl hat and cow print chaps! Another early wake up call, prompted a protein bar on the go, and a zombie-esque crawl to my corral. A trumpet sounded the anthem, queuing runners from their corrals onto the first mile of the course. Similar to the 10K, the half-marathon course had us starting in California Adventure. Runners legged it past the Guardians of the Galaxy ride, through Hollywood Land and towards the Ferris Wheel. The water was dramatic in vivid colors portraying a World of Color performance as I looped around the boardwalk. After seeing Russell, Mr. Fredricksen and Dug greeting runners by the Redwood Creek play area, the course took participants into Disneyland. The route passed through a backstage area where cast members stood with the horses that pull the trolleys up and down Main Street each morning! As a horse lover, I loved seeing them on course! After entering the park just behind Splash Mountain, runners were greeted by Woody as he waved from the balcony of the Saloon! I loved seeing the newly remodeled area where the Big Thunder Ranch BBQ and petting zoo used to be, now transformed by unfamiliar caves and abandoned train mines beckoning explorers. All smiles running through the castle! After bounding through the castle, around the Matterhorn and through Tomorrowland (Note: Distance sounds far superior than actuality) runners hit the streets of Anaheim. This is the point in the race where runners usually take it to a walk once photographers are out of sight. Due to the heat advisory, I noticed the energy was low and many runners were taking breaks less than a mile into the race. It was unusal not to have that excitement from atheletes around you, but luckily the cast members and course entertainment made up for it! A couple of miles along the Anaheim roads brought runners to wonderful and much-needed entertainment. I enjoyed the marvelous Mariachi band and dancers around mile 7, shortly followed by hula dancers, rolling their hips and hands to He Mele No Lilo (Main Title) from Lilo and Stitch. I always look forward to seeing the Classic Car Row during the run! This year did not disappoint. Many eager car aficionados were waving runners on and even honking their horns in acclamation. I could see the giant symbol for Angel’s Stadium growing closer with every stride. After a few minutes, I had finally reached the stadium. This was the stage of the race I was most excited for, waiting almost two years until I would run past the dugouts, along the field! An announcer read names from bibs, as young kids and family members waved outreached arms, hoping to snag a high-five. The energy was contagious and it really helped with the last few miles of the half-marathon. After exiting the stadium, shortly after, volunteers were passing out mini bags of Jelly Belly’s Sport Beans. Each small packet contained an assortment of flavors, containing electrolytes and both Vitamin B & C. While easy to consume, I appreciated the sodium and potassium but found myself missing the usual Clif gels found on Disney’s half courses. I carried onwards, seeing a freeway overpass coming into view. I had to laugh as Endorphin Dude behind me was commenting to a volunteer stating how he thought the course was supposedly flat. As I trotted up the “mountain” I could not take advantage or gather any momentum heading down towards the finish. Just within the last two miles it started to rain. When I thought it could not get hot enough, the combination of water and hot asphalt made the air more muggy. Finally hitting Katella and seeing the tops of attractions, I finally found the push I was looking for many miles back. I sprinted past the Disneyland Hotel, along enthusiastic cheerleaders with amusing signs, and clanging cowbells. I could not wait and get to the finish to enjoy a tall, cold , refreshing WATER! Did I mention it was hot? As I crossed the finish beside runners who looked as if they had just gotten out of a swimming pool, I could only eagerly anticipate the next twelve months until Disneyland half-marathon weekend would roll around again. While the temperature was much warmer than anticipated, I thought the race staff, volunteers and cast members went above and beyond to make an enjoyably fun weekend. After a hot weekend of running, I now have a new appreciation for water and Powerade! I made sure to hydrate just after collecting my medals. For completing the half, I received a Toy Story themed medal as well as the Double Dare medal for running the 10k Saturday and the half on Sunday. This medal displays Luxo Jr. and Pixar’s famous brick architecture! This will continue to be my favorite weekend of all the Disney races due to course entertainment and pure bliss of running down car row and through Angel’s Stadium. It is always a pleasure to reunite with friends and make some new ones with each race I run. I am enjoying this run journey thus far and cannot wait to see what the remainder of the year will bring! Hope to see you out on a course soon! Post race sadness is real, especially when you had as fun as a racecation as I just did. I spent most of the weekend in Anaheim running Disney’s Double Dare challenge. The weekend events dedicated themselves to famous Pixar films such as Up, The Incredibles, Monsters University and the beloved classic, Toy Story. I started my weekend by picking up my bib and browsing around the expo on Thursday morning. I was happy to find minimal crowds and was able to walk straight up to the volunteer and show her my ID. I received my bag tag, a small pamphlet on the weekend’s events, and an adorable luggage tag that resembled the Double Dare medal, commemorating the five-year anniversary. After taking a couple of pictures with fun backdrops, I headed upstairs to retrieve my race shirts and check out a couple of the vendors. All the runDisney expos are similar for the most part, give or take a booth or two. I enjoy the familiarity because I know where I can purchase items when needed. The Anaheim expos always have many vendors handing out fun freebies. Booths such as Goodsense and Raceguards were giving out handy medical items such as band aids, ice packs, samples of Biofreeze, first aid pouches and water bottles. ABC had items to be enjoyed by younger ones such as inflatable beach balls and a mini notebook and colored pencil set. While first aid items are handy, there were edible freebies too! GoGo SqueeZ apple sauce was handing out pouches of their product. For those desiring a natural option, Zespri was handing out their gold variety kiwi to eager expo attendees. Jelly Belly also handed out mini sample packages of their Sport Beans. After paying a quick visit to Fit2Run to buy some last-minute Gu, I took a picture with the Pixar Ball wall before heading back to my hotel. While I was hoping to add the 5k to my itinerary, it had sold out, leaving my weekend to start on Saturday with the 10k race. Every Disney run starts out with an early alarm, so I was off and running, well walking to the start at 4 a.m. With my badge adorned sash draped over my shoulder and my Wilderness Explorer flag hanging from my hydration pack, I headed to my corral. It is not every Saturday morning that I dress like a boy scout, so I wanted to make Russell and all of Troop 54 proud! Pre-Race entertainment from Carissa and Kevin made the time spent in my corral fly by. While I was hot in my polo shirt, I just tried to focus on the energy around me. Before I knew it the anthem led us to the start and it was time to run 6.2 glorious miles in celebration of Monsters University within the boundaries of Disneyland and California Adventure Park! Once I broke away from the pack, I was happy to find slightly cooler temperatures. Maybe it was the breeze as I flew towards California Adventure or the fact that I was no longer being sandwiched between runners, but I was determined to have fun and beat the rising temperature. Just as I entered the park behind the California Screamin’ coaster, I heard a clink and could see my grape soda pin plunge to the road. (Note: While not an avid pin collector, this one struck a chord with me when I bought it a few years back, so it was a tough one to hear clash against the asphalt.) Instead of stopping and squatting to pick it up and risk injuring myself and other runners behind me, I sighed and let the metal badge start it’s new life, lost to the graveled roadway. I charged on, entering the park by Radiator Springs, the sound of revving engines made my feet want to move faster. Numerous Pixar characters adorned the boundaries of the course. I saw Flik and Atta from A Bug’s Life, Russell from Up, Lightning McQueen and Mater from Cars, Mike and Sully from Monsters University as well as many dancers from various parades. The course did not dismiss classic characters such as Mickey and his friends which were found in Disneyland a few miles in. My favorite aspects of any Disney race are running through the parks and seeing the energy of the cast members, throwing high fives (complete with a Mickey glove!) at runners, and all the lively rides and lights operating before the sun. The race crew did a wonderful job having music and various cheer squads in the backstage areas, making every mile of the course spirited and vivacious. Special shout out to the course designer who opted not to use any of Anaheim’s streets for the 10k and kept all the magic and mileage within the two theme parks! Graduating to a Senior Wilderness Explorer! The weather was not ideal but I always love catching up with friends on course and seeing the creative costumes. Running through Disneyland at 5 in the morning never ceases to put a smile on my face! I had a monstrous good time at the 10k but after collecting my medal, water and a snack box, I was off to rest my feet and seek some air conditioning before running the half-marathon on Sunday. All smiles after the 10k! On non race mornings, hearing my alarm at 3:30 in the morning would usually prompt my hand to clash with my snooze button. On the morning of the S.F. Half however, I was up just before, eager to see what the city would bring. Two days prior, I found myself in Fort Mason waiting in a growing, twisting line to attend the expo. The San Francisco Marathon conveniently allotted hours both Friday and Saturday to pick up bibs, buy last-minute nutrition, and talk to reps about the newest and latest products. I was lucky enough to find parking just steps from the expo but I loved how the S.F. Marathon teamed up with nearby lots to help reserve spots as well as provide ferry transportation for those who desired other options. I arrived about thirty minutes in anticipation of the opening doors, to be greeted by local companies and vendors. Among them were Nitro Coffee, Clover Dairy and Jamba Juice. Clover was handing out free cartons of chocolate milk as well as offering samples of their new greek yogurt. Jamba Juice was also handing out smoothie shots for those waiting in line which proved to be a nice treat in the warm weather. Just a minute or two after my watch read noon, the doors opened, and the runners started to file inside. We were greeted by a DJ who was playing music to help set a fun tone for attendees. The expo was narrow and long and provided three main rows of vendors. Bib and T-shirt pickup were located in the back of the building so I proceeded there first. After reading my bib number to a volunteer, I showed him my ID and was off to collect my shirt. I was excited to see vendors such as Pro Compression, Nike, A Runner’s Mind and many others selling all the clothing, nutrition, and gear that a runner could dream of. I wish I could have seen a map of the vendors in advance so I knew where to spend the small window of time I allotted myself. Luckily it was easy to navigate after a fairly quick walk through, as long as I tried to avoid the eager sellers. After a speedy product demo for a muscle stimulator, I snatched a couple of tiny sample Power Crunch bars to satisfy my need for all things mini and headed back up the peninsula until I returned for race day. With a little prep, Race Day mornings go smoothly when one’s outfit is laid out and bag is packed the night before. After turning off my alarm I glanced at the floor, smiling at my red crab hat and Fisherman’s Wharf shirt. Perhaps I have done too many Disney races but either way I try not to take any run too seriously. I look to have fun, and if I am feeling good, maybe push for a PR. While I consider myself a morning person rather than a night owl, instead of driving myself into the city, I decided to purchase a bus ticket available to me when I registered for the half. I arrived at Millbrae Bart station at 4 a.m. just to give myself a nice fifteen minute window. I asked a fellow runner if she knew where the buses left from and told me she wasn’t exactly sure but pointed to a line of yellow school buses, indicating the answer. I had to laugh at the commentary coming from long-lost jocks and mathlete nerds voicing their disatisfaction at the dismal transportation. As I boarded the bus, a few more took seats behind me and we were off five minutes before our designated departure. With the freeways empty, our bus took us to the fog and start line. No race day morning is complete without a small hiccup which was caused by our driver who kept asking where the start line was causing panic for some and laughs for others. After departing from our bus, half a block of dimly lit street kept us from the corrals and glimmering Bay Bridge. After some quick photos, I entered my corral watching the other runners do so until my ears were greeted by the Cable Car Chorus. Their voices in harmony sounded lovely and gave warmth to the chilly morning. Soon the first corral was released to the sound of a cable car bell and I was off and running. I waved goodbye to the Ferry Building as I was off towards Fisherman’s Wharf. The first few miles were nice and flat, allowing me to find my stride. I was most excited to see the famous S.F. sights from foot but did not take into account how quickly the Ghirardelli sign would come into view only to be subdued by Chrissy Field, followed by the charm of the Marina architecture. A short but steep climb took me by surprise at Fort Mason and again just leading up to the Golden Gate Bridge. The first few miles had me anticipating the grandness of the bridge but once I climbed up to it, the towers were covered by thick fog. My body wrestled with comfort as my temperature rose from exercise and adrenaline only to be brought down by fog and mist the bridge spitted at the passersby. I started to see the main cables descend and I was excited. I was almost across! A few minutes passed and the cables started to climb upwards and I realized I had forgotten about the second tower, marking my reality. Not only was I only half way across, but my mind was already building a wall. The slight incline to the Vista Point turn around gave me something to look forward. While I was slowly moving uphill, I would be able to run down it soon. I took a package of Gu chews from a volunteer and continued moving forward. The return trip on the bridge seemed much quicker despite a few testing elements. My shoes were soaking wet from water that collected on the roads, causing a blister to form. I decided to treat it rather than suffer the final two miles through the Presidio and Golden Gate Park. Rolling hills awaited me but I pushed through, seeing signs for the park and finish line. The last half mile had nice energy with the 2nd Half Runners just commencing and the Full runners carrying on. I felt a surge of energy once I was greeted by the Mile 13 marker and could see runners sporting mylar blankets and new medals around their necks that would soon find a home resting against walls, hanging from racks. The finish line reception for the first half marathon finishers offered food, drinks and a large grassy area to celebrate and rest tired legs. The first of many stations to greet my post race needs was an Irish coffee bar. While there was an option for a regular cup of Joe, I welcomed a splash of Bailey’s into my cup and continued towards more tables of provided snacks. Muscle Milk was handing out bottles of their signature protein shake. Power Crunch offered full bars to finishers in an assortment of flavors. For the runners who just want a more natural option, bananas were available as well as fruit cups. A short walk reunited me with a row of buses which would drive finishers back to the start line which was transformed into a celebratory festival. After a short ride, I exited the bus and walked over to a collection of tents. There was a beer garden which offered Lagunitas and Golden State Cider. A rep from 4505 Chicharrones was giving out samples of their pork rinds which are locally made in delicious flavors such as Jalapeño Cheddar and Smokehouse BBQ. I loved the touches of local products that were found both at the Expo and Finish Line Festival. While running in the city had a different vibe than expected, the SF Marathon team put on a fun race, complete with a unique and challenging course. Albeit quick, I loved running by sights such as Fisherman’s Wharf, Ghirardelli, on either side of the water and architecture of the Marina and of course across the Golden Gate Bridge. I cursed the hills then but thank them now for providing themselves as one of the many stepping-stones along my journey. Hope to see you out on the roads or trails soon! It was time to take RNR Las Vegas off my race bucket list and turn it into a reality for 2017. After registering for the half-marathon over the summer, I toyed with the idea of adding the 5k to my itinerary in order to receive the Remix Challenge medal. After a quick monorail ride from the MGM Grand, the expo was located just a few steps from the Convention Center station. Volunteers and a collection of signs pointed participants in a counter clockwise loop, the bib pickup being stop #1. Next, I was ushered towards a shirt table, where I was given my pre-selected size in a plastic drawstring backpack that contained some samplings of SmartyPants vitamins and a Black Forest Gummy packet. The next section of the expo was dedicated to Brooks gear allowing eager attendees to try on the latest in footwear or buy Las Vegas specific wear. The most popular item to be noted at the 2017 expo was the neon yellow, Vegas Strong shirt. As I stood in the merchandise line, it took close to an hour. I felt as if I were waiting for one of Disney’s newest attractions! I wish I had been in possession of a Tourpass as one of the perks was an express checkout lane for holders. Vendor booths took up the rest of the expo with retailers selling anything from clothes and shoes to nutrition. This would be my thirteenth half, and by now, I like to think I know what works for me, so I passed on through. As I neared the exit, a small section was devoted to Rock n’ Roll event registration. Medals that screamed, “I would look really good around your neck or fastened on your wall one day,” glistened as they hung from their mounts right above the registration tables. With computers open to the registration page and my debit card placed in my hand so conveniently, I headed to the desk and signed up for the evening’s 5k. Aren’t you supposed to go big or go home while in Vegas? With only a couple hours before the run, I headed back to my hotel in order to rest before a nice 3 mile shakeout. Taking the monorail back to the SLS Station proved to be an interesting ride. The cars were full, sardine cans on steroids full. When the monorail came to an abrupt stop, there was no need to hold onto anyone or thing because no one was going anywhere. What must have looked like the word’s largest parade of clowns exiting a car, I headed out of the station and through the hotel with my fellow runners. Across the street, stood lines of runners trying to gain access into the Festival Grounds. While I appreciated added security checking bags, this process was slow. Only a few lanes were open to 7,000 runners. I did not even possess a bag but could not see an expedited way through. I paid a quick trip to a huge row of indoor bathroom stalls. These were a nice touch and it was pretty funny to see fellow runners taking selfies and hear their commentary. Once at the start, I noticed security attempting to keep runners honest but still I saw a few people surge ahead toward their desired corral. Since it was only a 5k and the road was wide enough, this did not cause any problems that I noticed during the run. The course took me out along Industrial road. 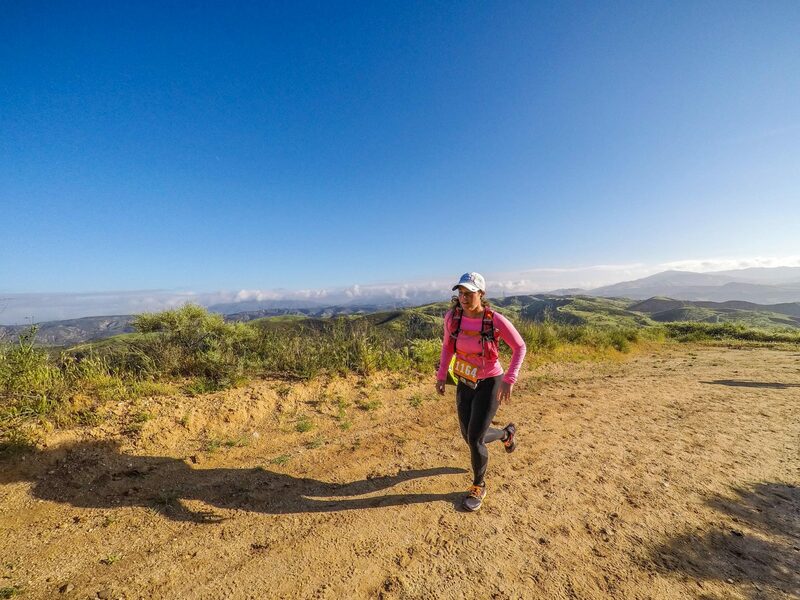 This course leaves the eyes searching for a little bit more, but with a quick three miles, there is not too much time to overthink the lack of scenery. Since it was an out and back, I was able to cheer on the front runners which is always fun! On a road littered with potholes, I focused on the handful of stations along the course, complete with music and flashing lights. While these were DJ’s rather than live bands, it was still nice to have some entertainment on course. Before I knew it I was already returning back into the festival grounds and even ran between a rockstar’s legs! This impromptu decision turned out to be fun and the perfect shakeout before Sunday’s half! I collected my medal, finisher’s snacks and turned in for the evening. While the Goo Goo Dolls were scheduled to perform just after the 5k instead of at the start of the half, I was a tad too chilly to sit and enjoy. With a little more entertainment, runner specific monorail trains and more security lanes, RNR is close to having a flawless 5k event. I enjoyed a chance to stretch the legs over some flat and fast road while adding some nice hardware to my collection. With tuned strings, I was ready to rock the remainder of the weekend. I channeled my inner white rabbit on Sunday and ran like I was late for a very important date! Waking up on race morning I was overcome with a feeling of excitement. I felt so lucky to be back in the french countryside running one of my favorite half marathons. After pulling on some Lulu tights, a red shirt adorned with accents giving subtle hints to the Alice’s Wonderland trapped rabbit, a tutu for extra race strength and speed, I was out the door. I followed the path along the water’s edge, walking up towards the event hall which was just minutes from my hotel. I passed through some security guards and was happy to see my corral was fairly empty. Forty minutes of standing usually feels long to me but with the help of pre-race speakers, music and group stretching, it was go time! Dazzling fireworks at the start! Being in France made me miss the usual anthem sung start but the fireworks exploding into the sky, sending runner’s through the start line was spectacular. The beginning of the course prompted runners through the Studios park first. The path took competitors into a slightly different entrance than the 5 and 10k races, still going through the Toy Story and Ratatouille themed areas as well as along the Tram Tour path. KM markers for 25th Anniversary! While I had run through the main park the morning before, I could run through it a thousand more times and still feel the same level of excitement! Runners entered through the backlot leading them through the ranch area and around part of the Thunder Mountain waterfront. Finally we hit Main Street U.S.A featuring many ecstatic cast members landing high-fives, wiggling handmade signs, and cheering in metachronal rhythm. The genuine feeling of excitement could be felt by all. Mickey and Minnie were stationed at the top of the avenue, decked out in their glittering blue suit and dress. I have to say it is a fun sight to see the castle in all of it’s sparkling 25th anniversary glory at the end of the iconic street, as you bound towards it. After a quick loop through Adventureland where runners could pose with Captain Jack Sparrow and all three hyenas from The Lion King (Shenzi, Banzai and Ed) it was time to pay a quick visit to Fantasyland before running through the castle. Rapunzel and Flynn Ryder were posed with chariots just by the It’s a small world attraction. Runners went into the extensive backstage area but it was not long until we found ourselves back in Tomorrowland. Nick Wilde from Zootopia greeted runners as well as Sadness from Pixar’s Inside Out. Once leaving the residential roads, asphalt turns to dirt and short loop takes runners around a pond. More french students dressed in cheer attire complete with luxuriant pom-pom’s gave a much-needed boost. A man I had recognized from the previous year had once again set up his kite display. While these don’t draw breath from the wind, metal stakes plant them in place. The array of colors and patterns is beautiful and they seem to wave runner’s onwards creating a tunnel of zest. It was just about the half-way point and I glanced at my watch to get a feel for the time since non of the kilometer markers on course have timers. I had to do a double take! My watch was displaying a time that was a similitude to some of my faster 10k’s. With another 6.5 miles to the finish, I was determined to keep up a good pace! After passing through a water station, I found myself on the backside of the pond, a canopy of trees pitching shadows to the rising sun. The course here becomes more rugged with wet grass and potholes. This short stretch of varied terrain requires the brain to be sharp for optimal foot placement. Soon my feet were striking pavement once again and the course herds runners back towards the resort. Letting the momentum pull me forward, runners turn off down an avenue, a straight shot to the hotels and parks. Fields of green and yellow line either side of the road and towering trees provide nice shelter. It had the appearance of an avenue fit for Austria, harboring climbing von Trapp children. A sharp right turn takes runners into the entrance of the Hotel Santa Fe, one of Disney’s themed hotels playing tribute to Cars. With beige tones and cacti every few feet, I kept my eyes peeled for any troublesome tumble weed threatening my path. Running around the backside of the hotel, runners came up on Hotel Cheyenne, modeled after an old western town. Food and water were stationed by the entrance into this particular property. After weaving around the Saloon and Chuck Wagon, runners soon tipped their hats to Butch Cassidy and followed the river leading back to Lac Disney. We hit the Lac and a quick loop would take participants back into the Village and backlot before I arrived at the finish line with a twelve-minute PR. I was misty-eyed. Last year this race mean’t so much to me to be able to travel solo from the States and create friendships and experience what it means to be a runner. Once again, this year demonstrated the love and strength found within the running community between the competitors and those on the sidelines rooting us on. While I was never shooting for a PR, I sure can see how my Dopey training is allowing me to find my stride. After throwing my hands up and hearing the announcer state my name as I traversed the line, I went to receive my finisher medal. I got into another line to receive my Bibbidi-Bobbidi-Boo challenge medal since I completed the 10k the morning prior as well as the Castle to Chateau medal for running a half in Paris and the U.S.
Earned my medals this race weekend! I wanted to savor the moment, not sure if I would ever be that fast again! I texted that to my best friend who stated that I wouldn’t be. I would be faster! With my medals clanging victorious chants from around my neck, I made my way back to the hotel all smiles from a perfect morning. The 10k course was probably my favorite of the weekend but I will most likely find myself typing that again as I write the half-marathon review! In general I do love the 10k distance. Perfect in the sense of feeling accomplished after completing but not so exhausted where one’s day is jeopardized. After finishing the 5k only hours before, I was happy to find my feet and legs felt pretty fresh as I headed over towards the expo and event hall. Both the 10k and half started steps from the events area used to pick up bibs, purchase merchandise and drop bags come start time! Only three corrals and many mini waves restrained runners to their designated start. A, B and C corrals weaved around the announcer’s stage just outside the both theme parks. At promptly 7 a.m. the first wave was released, as Flora, Fauna and Merrywether sprinkled some of their magical dust on the chilly morning. The course took runners on a similar route to the previous evening’s 5K. A quick entrance into the Walt Disney Studios park had runners entering Studio 1, a giant warehouse modeled after Hollywood’s finest. Bright lights, cameras, and iconic derby hats (Did you think I was going to say action?) decorate the interior of Studio 1, playing tribute to the golden age of Hollywood. As quickly as runners entered the studio, the exit led them towards Toon Studio and a quick loop brought us around the Paris themed Ratatouille section of the park. I swear I could smell steak frites cooking in Bistrot Chez Remy as I ran by! After helping Buzz with his blasters, with a quick visit to theToy Story Land, it was back on the tram route before switching parks. I ran under the Disneyland Hotel and I was soon dancing down Main Street. Just a Disneyland Tour Guide out for a run! I could hear massive french chants and enthusiasm from all the cast members, lining up under the Walt’s childhood themed shops and street. I flew by Thunder Mountain, into Fantasy Land and through the castle! Just on the corner of Tomorrowland stood a giant bronze dragon, puffing smoke accompanied by the fairy trio from Sleeping Beauty. This picture perfect scene of characters was beckoning runners to stop and take a photo. Since the line was long, I opted to keep going. Loving Disneyland Paris’ unique character stops! I blasted past Space Mountain and entered a back stage area that lasted just under one kilometer. I was transported once again to Fantasyland where I stopped for a quick photo with the White Rabbit and Cheshire Cat. As two of us were all grins, the White Rabbit told me I was running late so I bid the duo farewell, bounding through Adventureland. I cheered on some pirates and left the park for another kilometer of backlot. The final bit of Disneyland park had runners going through a western town, a photo op with Woody and Jessie before a quick glimpse of Le Phantom Manor. We had a contest to see who could smile the biggest! Did I win? Exiting the park at the 8km mark, my legs felt great so I pushed onwards. At this point runners found themselves back on the tram route, heading towards Studio 1 and the finish. Similarly to the 5k, the 10k course revived the hair pin turn which led runners back onto the stage of the Motor Action Stunt show. Once again Emile and Remy were greeting runners, complete with chef hats and baguettes! I was happy I did not have to stop for this photo after taking a pause from my run the night before in order to greet the rats! A straightaway sprint had me crossing the finish line with one of my fastest 10k times to date! After looking around for a timer and asking some of the other finishers they all confirmed what I feared. The 10k was not timed. While I was hoping to use the time for some 2018 races, what can I say? I had a blast and I finished well! There is no documented proof of red numbers on a clock but aren’t all times just moments of pride for the heart and mind? As I headed out with some Lactel protein drink, Powerade, water and a snack box, I turned back, remembering I had forgotten to get my Bibbidi-Bobbidi-Boo Challenge bracelet. This was announced multiple times at packet pickup that all runners who completed the 10k would need a wristband in order to receive the challenge medal once completing the half-marathon the following morning. While some people near me had wristbands on, upon asking a member of the race staff, she stated it would take too long to tag each challenge runner. As long as we had our challenge bib upon finishing the half the next morning, that would be enough. I hoped no one would take advantage of this modification and accept unearned medals but that would be a problem for race staff, not me! I headed back to my hotel to enjoy breakfast and rest up before the half-marathon.